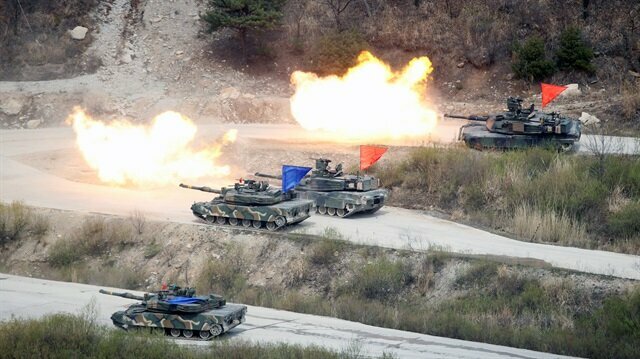 File Photo: South Korean Army K1A1 and U.S. Army M1A2 tanks fire live rounds during a U.S.-South Korea joint live-fire military exercise, at a training field, near the demilitarized zone, separating the two Koreas in Pocheon, South Korea. When South Korean businessman Kim Yong-tae worked with North Koreans at the Kaesong Industrial Complex before it was closed in 2016, one of the biggest challenges was communicating in what is ostensibly a shared language. "There were confounding moments because there were terms I never heard of while working and living just in South Korea," he said, describing blank looks from some North Korean workers when he used the word "container," which is pronounced similar to its English term in South Korea. Between the South's increasing adoption of international terms and the North's political sensitivity to some words, the growing language divide is complicating cooperation on a range of joint cultural and economic exchanges as ties between the neighbours improve. To counter the confusion and promote a feeling of unity, the South Korean government is working to restart an obscure academic project aimed at developing a common Korean language dictionary with the North. North and South Korea speak the same language based on the Hangeul alphabet, but after decades of division, only about 70 percent of words are mutually understood, according to some experts. The two Koreas officially maintain the goal of reunification, but as each side has developed in strikingly different ways, that dream has faded. North Korea's government has maintained - at least officially - a tight grip on its economy, meaning many North Koreans are unfamiliar with some economic and business terms common in the South's more capitalist system. "Homelessness, yearly rent, monthly rent: The North Koreans have no such terms since everything is owned by the state which gives out housing," said Kim Wanseo, a South Korean lexicographer on the committee working to compile the dictionary. After she defected to the South in 2002, Kim Young-hee said she had to learn a number of financial terms that didn't exist in the North, including the words for stocks and shares. "When it comes to general terms, I would say seven out of 10 words can be mutually understood by people from each side," said Kim, the lexicographer. "However, when it comes to jargon and technical words there is a big, big difference between the two now." The North's cultural and political isolation has also meant North Koreans have adopted fewer English words. This became obvious when the players from North and South Korea combined for a joint ice hockey team during the Olympics. "The only two words we shared were 'skates' and 'puck'," said Kim Jung-min, spokesman for the Korea Ice Hockey Association. "We had to coordinate before all training started, and we printed out the list of different terms between the two and stuck them on the athletes’ lockers." In the wake of April’s summit between North Korean leader Kim Jong Un and South Korean President Moon Jae-in, the two counties have embarked on a number of cooperation projects designed to avoid running afoul of sanctions. Besides the dictionary, began in 2006 but halted in 2015 due to political tensions, projects being discussed include the archaeological excavation of a palace in North Korea, performances by a North Korean art troupe in South Korea, pest control projects in the North, and a number of sporting events. And in a gesture of unity, North Korea changed its time zone by half an hour to realign with the South. The South's Unification Ministry says preserving and unifying the language is needed to prepare for eventual unification. Politics is never far away, however, and past dictionary discussions with the North Koreans often involved sensitive terms. For example, the dictionary's authors had to avoid one term for "him," which was typically used only to apply to North Korean leaders, and the United States could not be mentioned in examples, said Kim, the lexicographer. The sides debated the definition of the word "dong-mu," which means childhood friend in the South, but has come to mean comrades who experienced the communist revolution together in the North. "We had to negotiate what an impartial definition is – and ended up defining it as ‘someone who strives together for a single goal,’ Kim said. Other debates were less serious. In South Korea, the verb "sal-ji-da" is used to say "hey, you’ve gained some weight." "It’s insulting in some contexts here too, but it’s a very insulting word to the North Koreans - to a whole new level," Kim said. "They only use this verb for farm animals."